Achieve salon results at home with Tweezerman's Dual Sided Pushy Cuticle Stick; the perfect tool for manicures and pedicures. The dual-ended stick features a soft touch coated body for grip and comfort, and two stainless steel ends with buffed edges for gentle performance that won’t scratch the nails. The scooped end is contoured to perfectly follow the shape of your cuticles, and the thinner, flat end is designed to push corners and hard to reach areas of the cuticle. Expect expert results. Long-lasting and easy to clean. - K.N. Rub ample amounts of cuticle cream into clean nails and hands to gently soften skin and cuticles. 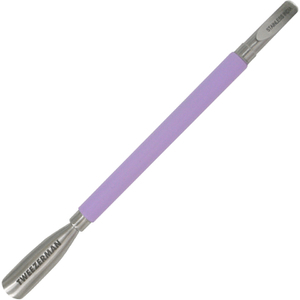 Gently clean under and around the nail using the fine end of this quality, stainless steel tool. Use the "Pushy" end to delicately push back the cuticles on each hand. If there is excess dead cuticle build-up, trim extra-carefully with nippers.